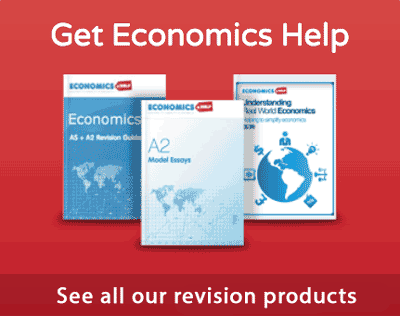 Home > Economics help blog > debt > Does Government Debt Matter? Readers Question: Does Government debt matter? Do high fiscal deficits threaten economic stability? Many worry that high levels of government debt could cause economic instability. In certain occasions, countries with high debt have seen investors lose confidence, leading to higher bond yields and putting pressure on the government to slash spending, for example, several countries in the Eurozone (2010-12). 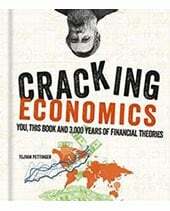 In rare cases, governments with high debt have responded by printing money – causing inflation to spiral out of control, for example, Germany in the 1920s. Another potential problem is when government debt is financed by overseas borrowing. If overseas investors lose confidence and sell their debt it can cause a loss of foreign exchange and a destabilising devaluation. However, in many cases, high levels of government debt do not cause instability – but can actually prevent a deeper recession. 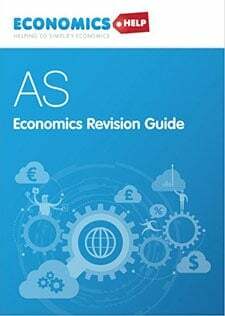 The main argument for government borrowing is that in a recession, government borrowing and government spending can help prevent a collapse in demand and economic growth. In a recession, generally, people save more and so wish to buy government debt. This means governments can often borrow cheaply to finance public sector works. 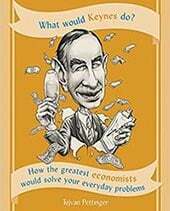 In the 1950s, national debt in the UK reached 200% of GDP, but it did not compromise economic growth or inflation. 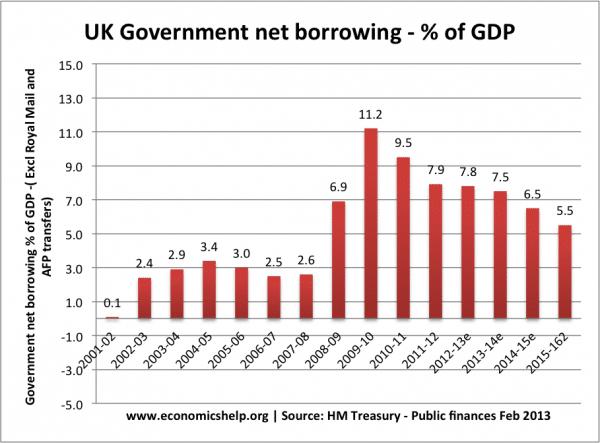 The UK was able to reduce this debt burden over several decades of economic growth. It depends on how it is financed – e.g. does it rely on overseas borrowing which can be riskier? What are the prospects for economic growth? – With economic growth, the debt to GDP ratio is likely to fall. If you are stuck in recession, the debt to GDP ratio will likely rise. Are domestic investors willing to buy government bonds? Japan has very large public sector debt, but it has a large pool of domestic savings so the government has been able to borrow cheaply. Is the debt cyclical or structural? Debt is a bigger problem if the government is borrowing heavily during a period of growth and there is a structural deficit. High fiscal deficits mean the government is forced to borrow a large sum – Annual government spending is greater than tax revenues. 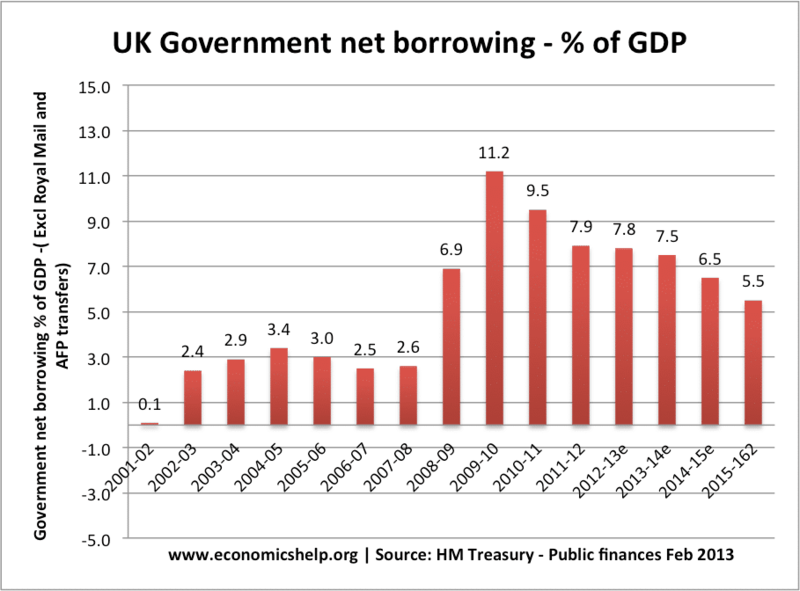 For example, in 2011/12 the UK government will have to borrow an estimated £125bn (just under 8% of GDP). Anything over 3% of GDP could be classed as a high fiscal deficit. 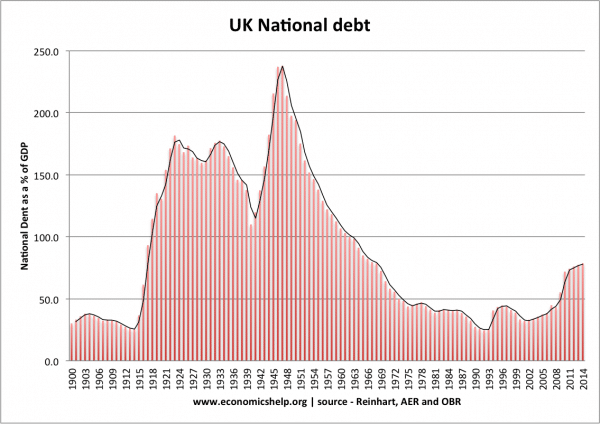 Did UK debt cause instability? Low inflation. Because of the recession, demand-pull inflation was low. In 2011, the UK had some cost-push inflation, due to rising oil prices and taxes, but this has largely dissipated by the start of 2014. In a recession, investors wish to buy the security of bonds rather than riskier investments like houses and shares. The low bond yields reflect a pessimistic outlook for economic recovery and future inflation. Markets were convinced that debt levels were not unsustainable. The UK has had much higher debt levels in the past, and higher borrowing is to be expected in an economic downturn. The fiscal deficit counters the fall in private sector spending. Inflation. It is possible a government may respond to a high budget deficit by printing money. If a government does print money, this could easily cause inflation. For example, Zimbabwe in 2009 and Germany in the 1920s had high budget deficits and they responded by printing money. Therefore, high deficits could be potentially destabilising. In the UK, quantitative easing didn’t cause inflation because there was little increase in M4 (Broad Money Supply). In the Eurozone, high fiscal deficits have raised fears over the ability of governments to repay debt. In the case of Greece, the level of the budget deficit seemed unsustainable – especially given the prospects for lower economic output. In other European countries, like Spain and Italy, markets are also worried that there is no Central Bank willing to step in and act as lender of last resort (like the UK could). Therefore, we have seen rapid rises in bond yields. This is destabilizing because it has forced these countries to cut spending and risk even lower economic growth. This lower growth, in turn, makes it more difficult to reduce debt to GDP ratios. 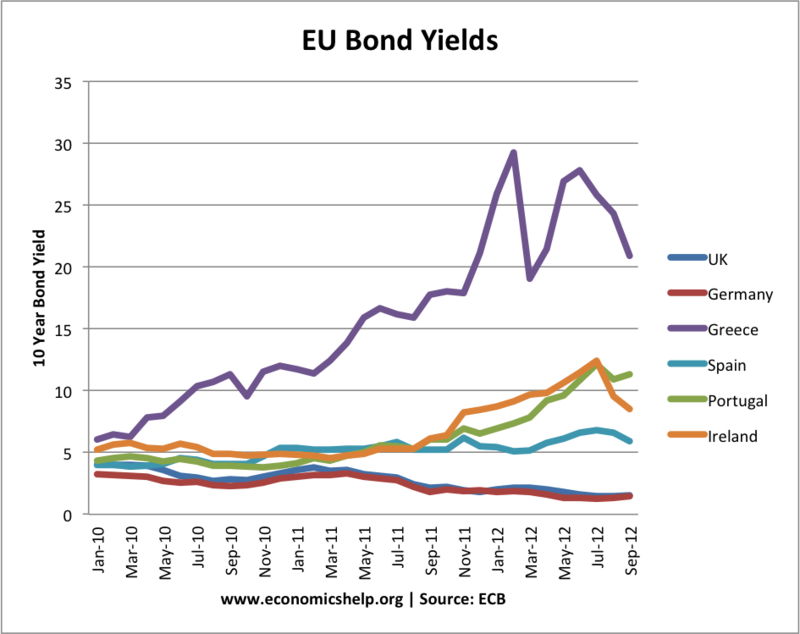 Since 2012, bond yields have been reduced because the ECB has been more willing to intervene in the bond market. Fears over default could lead to a fall in the value of exchange rate. Government debt implies future taxpayers will be responsible for repaying debt. Future generations also benefit from current government borrowing. Government debt may be funding investment and infrastructure improvements, which lead to higher growth. Government borrowing may help economic recovery and reduce unemployment. This will benefit future generations. However, if borrowing increases faster than real GDP, then government borrowing may require higher tax rates. Also, if we assume rising real incomes, government borrowing helps redistribute income from future to present. This can help smooth income over time. It depends on levels of private sector debt. e.g. in a recession, private sector borrowing falls as the private sector save more. Public borrowing can thus offset the rise in saving and fall in spending which threatens a recession. It is important to look at overall debt. However, if there is a rise in private sector debt and government debt, this is potentially more serious and liable to cause crowding out and be unsustainable. It depends on whether borrowing is sustainable. Do markets feel, the government has borrowed too much? Is the debt to GDP ratio going to keep rising, making it increasingly difficult to repay? In the early 1950s, UK national debt was over 200% of GDP (in 2012, it is 63% of GDP). But, this level of debt didn’t burden the UK. It was a legacy of the Second World War and spending on the Welfare State and nationalising industries. It laid a foundation for three decades of economic prosperity. 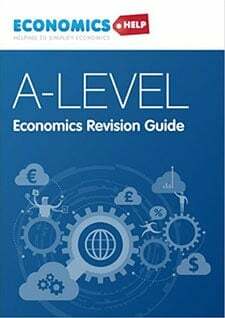 This entry was posted in debt, economics and tagged debt. Bookmark the permalink. I’m grateful for this because one has been wondering if the spate of high debt to GDP ratio that some countries have will ever be repaid. But with your write up i believe with greater fiscal discipline they will bounce back as in the case of Argentina. Of course like most of the articles on this website it is either plain wrong or misleading. When the private sector is deleveraging. Households, private sector companies and banks are all reducing economic activity and hoarding cash (£600 billion of it) the state has no choice but to make good the difference. Public sector debt is private sector income (by definition) and it matters not a jot. 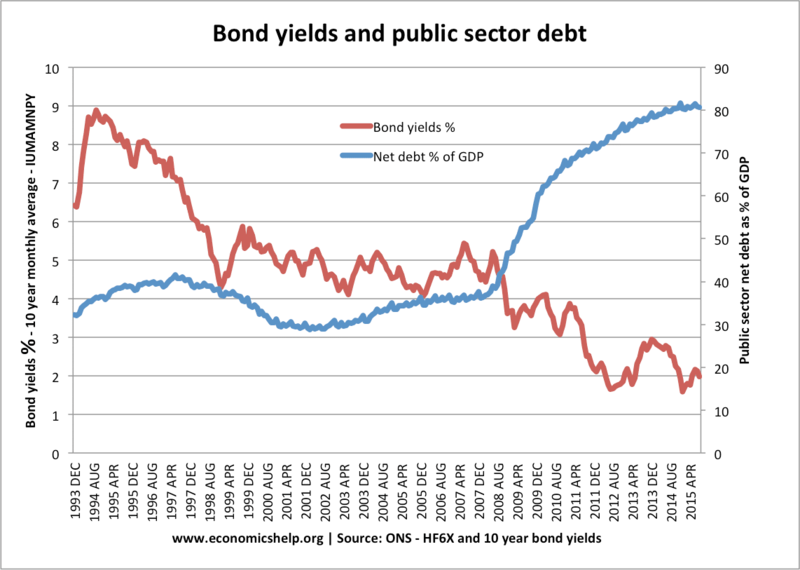 As MMT proves – higher public sector debt DECREASES gilt yields. 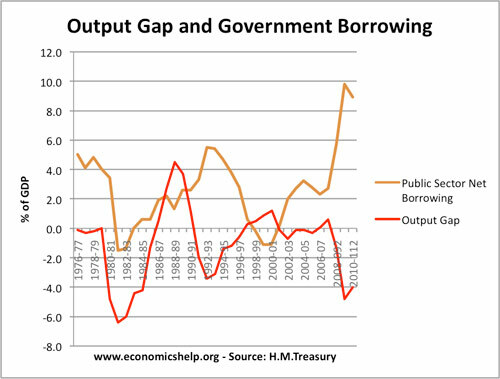 The current governments policies will fail by definition – look at the graphs – public sector debt = private sector surplus + balance of payments ALWAYS. The government may reduce spending on useful activities such as education, health, teapot but it will always be replaced with higher spending on housing benefit, unemployment benefit and lower tax revenue. All at the cost of lower growth and higher unemployment.